There are, it strikes me, not one but two Oscar Pistorius trials beginning in South Africa at Pretoria's High Court on Monday. One is relatively straightforward - call it "The State v Oscar Pistorius". The other is a much more fickle beast, which you could sum up as "Pistorius v Pistorius". Both trials present huge challenges for the Olympic athlete and his high-powered legal team. But while it is, of course, early days, my suspicion is that the latter trial could prove the most awkward for him. The first trial will see the prosecution attempt to prove that Mr Pistorius knowingly, intentionally, murdered his girlfriend, Reeva Steenkamp, during a heated row on Valentine's Day last year. For this, the state may well start with the forensics at the crime scene - the angle of the bullets, the distance Mr Pistorius was from the bathroom door when he pulled the trigger; anything - autopsy included - that can raise doubts about, or directly contradict, the athlete's version of events provided at the bail hearing. Then there is the possibility of witnesses, or phone records and text messages, which might suggest that the couple were arguing in his house that night - something he has furiously denied and which surfaced only briefly at the bail hearing. And lastly, there is his character. 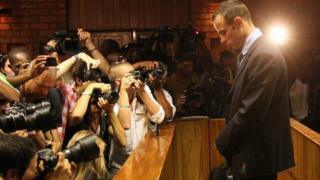 If the prosecution can find cause to slip it past the judge - who may rule against anything that smacks of unwarranted "character assassination" - we are likely to see a parade of ex-girlfriends and acquaintances who may throw light on the couple's relationship, and on Mr Pistorius's allegedly volatile and "trigger-happy" temperament. All this is likely to dominate the headlines and occupy much of the trial itself. We've already seen a number of alleged "leaks" regarding the state's case. The defence team will respond by painting its own, even more detailed picture of what Mr Pistorius insists was a terrible case of mistaken identity. In this, he has the advantage of well-resourced investigative and legal teams, and - cynics would argue - the lack of other living witnesses inside the house to contradict his version of what happened in his bathroom that night. On the other hand, all the state has to do is prove that the athlete was lying about any single aspect of his bail-hearing testimony for Mr Pistorius to be in deep water. That is why it was such a risk for the athlete to give his version of events in such detail a year ago - a move prompted by the state's decision to charge him with premeditated murder and to force him to fight hard to secure bail. The state's case - and the memorably hapless performance of now ex-lead detective Hilton Botha - took a battering at that hearing. Did the state have more compelling evidence that it chose not to reveal? Or was it, as some analysts have suggested, playing the "premeditated" card simply in order to force Mr Pistorius's team to reveal its own hand early on to keep him out on bail, and perhaps to try to manage the early damage to his reputation? A great deal hangs on the issue of what new evidence the state presents in court, and to what extent Mr Botha's shambolic version of events remains intact. As for the second trial: "Pistorius v Pistorius". Let us assume, for a moment, that Mr Pistorius's testimony - his version of events - is gospel truth, and that, despite flinging plenty of mud at his character and raising a few niggling questions about the forensics, the prosecution cannot fundamentally prove otherwise over the course of the next few weeks in court… Then what? Now comes the prosecution's second chance. By his own admission, Mr Pistorius shot four times at someone he had not seen, or conversed with, or positively identified in any way; someone who, he suspected, was hiding behind a door in his upstairs bathroom. This is the "high-water" scenario for the athlete - the best possible version of events that his team can now present to the judge. Yes, his defence will say, but he was on the stumps of his legs, feeling the sort of vulnerability that an able bodied person cannot begin to understand, and convinced an intruder meant him and Ms Steenkamp harm in a country where violent burglaries are relatively common and, perhaps more relevantly - given that Mr Pistorius's house is in a heavily guarded and virtually crime-free estate - where a pervasive sense of vulnerability grips many communities. No, the state will counter, Mr Pistorius - an experienced gun-handler - should have done more to find out who was in there, and whether they were armed and dangerous. Will she - should she - choose to make an example of Mr Pistorius? It is at this point that the trial veers away from narrow issues of evidence and proof, and into more subjective territory, not just concerning the interpretation of existing law, but about what constitutes "reasonable" behaviour in a country like South Africa, and what sort of message Judge Thokozile Matilda Masipa intends to send to the public at home and abroad. She will be under intense scrutiny - from the media, from a government concerned about South Africa's international reputation, from campaigners highlighting the shocking levels of violence against women here, from a police force worried about vigilantism, and from a public with strong views about one of its most iconic sporting heroes. Some of this she can, and should, shrug off. Other pressures will be harder to ignore. What signals would it send to the public if he walked free? If he is found guilty on the lesser charge of culpable homicide, should he still serve time in jail or would a fine and a suspended sentence be more appropriate? How to find the right balance between natural justice and procedural fairness? If the first trial does not go Mr Pistorius's way, of course, none of this matters. He will be found guilty of murder and go to jail regardless. But even if he makes it through the first trial intact, then he still faces a daunting battle.